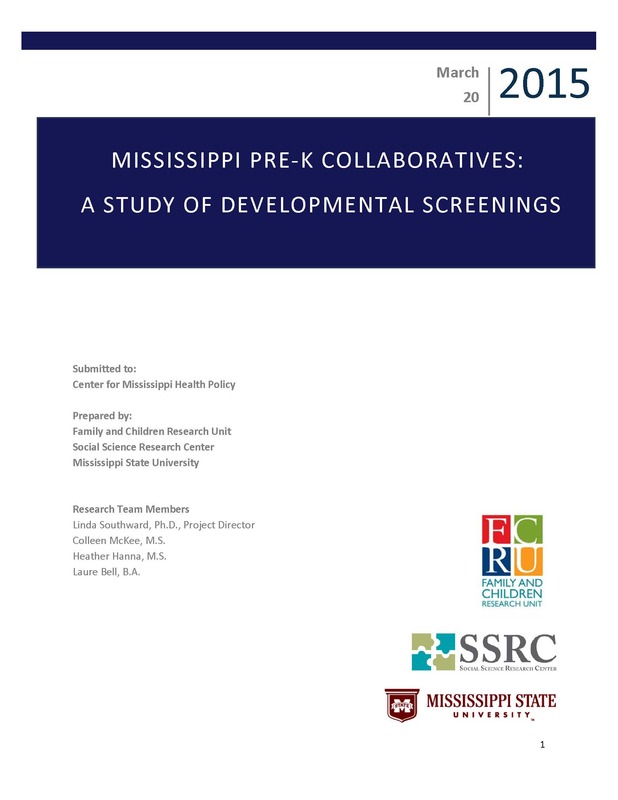 The Center for Mississippi Health Policy commissioned Mississippi State University’s Social Science Research Center (SSRC) to conduct a study implementing developmental screening in each of the eleven Pre-Kindergarten Early Learning Collaboratives funded by the State. The goal of the study was to determine the developmental concerns of children entering Pre-K in Mississippi and the policy implications that these needs have for the state. The project used the Ages and Stages Questionnaires, Third Edition (ASQ-3) and the Ages and Stages Questionnaire: Social-Emotional (ASQ-SE). These widely used instruments are considered valid and reliable for assessing developmental progress for children ages 1 month to 5 years. 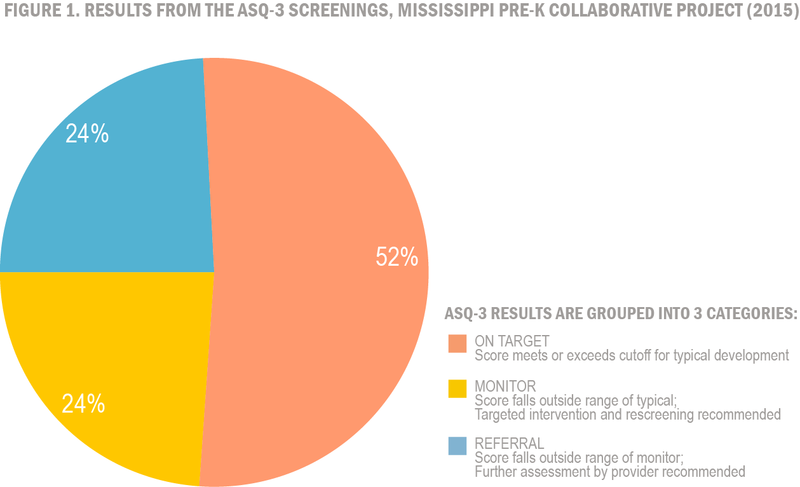 Of the 1,786 children who attended the Pre-K Collaboratives in 2014, approximately 1,350 children were screened. 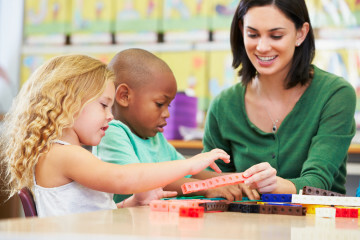 Findings from the ASQ-3 screenings indicate that nearly one-quarter (24%) of children screened scored in the “Referral” range, indicating they needed a comprehensive assessment to determine the nature of a potential developmental delay. Another quarter (24%) had scores in the “Monitor” range, meaning they should be provided targeted attention and re-screened. The remaining half (52%) scored in the “On Target” group, indicating typical development. Developmental screening is the use of a standardized tool to evaluate if a child is reaching physical, mental, emotional, and social development benchmarks within a desired period of time. “Developmental delay” is a term used to describe when a child under the age of five does not meet the expected milestones in a timely manner. Risk factors associated with developmental delay are particularly relevant to Mississippi and include poverty, minority status, low parental education, and low birthweight. With appropriate intervention and instruction, many developmental delays can be resolved before advancing into a lifelong condition. Data from Mississippi’s statewide Kindergarten Readiness Assessment in the fall of 2014 indicate that 65 percent of students are not ready for kindergarten. KIDS COUNT data show that by third grade, 50 percent of Mississippi students are scoring below proficient on standardized reading tests. North Carolina has documented success in using early childhood education to significantly decrease placement in special education. One study in that state showed a reduction of 39 percent in the likelihood of a student being placed in special education in third grade. A key to the program’s success was raising preschool developmental screening rates to 98 percent. States have implemented a variety of strategies to increase developmental screening rates and identify children with developmental delays. Most states have worked through the Medicaid program to provide incentives to screen earlier. Some states require EPSDT screening to include developmental screening at appropriate ages. Some state Medicaid programs pay separately for developmental screening, using a specific CPT code. Some states have worked with Medicaid managed care organizations to use financial incentives or penalties to ensure children receive appropriate developmental screening. Many states have fostered partnerships between programs such as Title V Maternal and Child Health, Part C Early Intervention, and Special Education/Child Find. States have collaborated with private providers and incorporated recommendations of the American Academy of Pediatrics, particularly the evidence-based Bright Futures guide for preventive care. 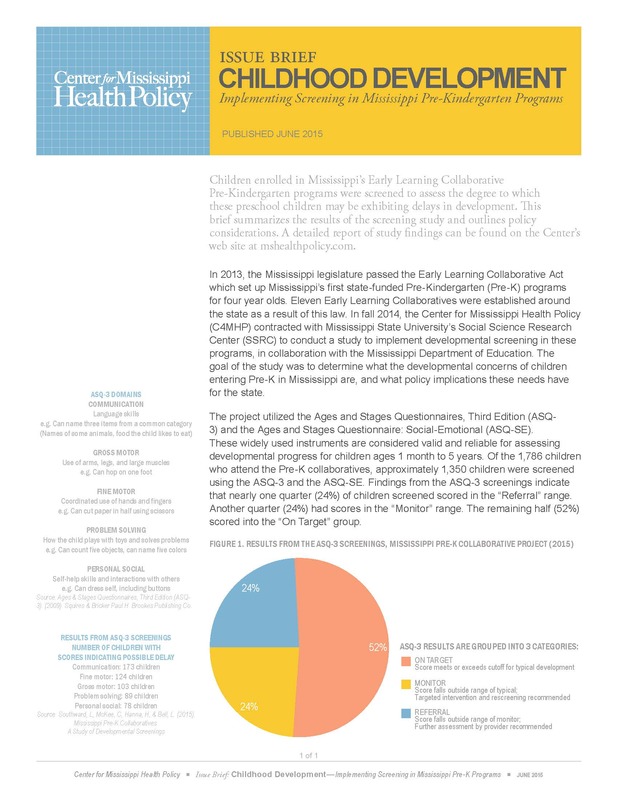 More detailed findings and policy implications can be found in the issue brief, Childhood Development: Implementing Screening in Mississippi Pre-Kindergarten Programs. The issue brief may be downloaded HERE or by clicking the link at the left of the page. Mississippi KIDS COUNT at Mississippi State University’s Social Science Research Center has produced a brief, “Countdown to Kindergarten: The Impact of Social and Emotional Development on Academic Success,” that examines the findings from the ASQ-SE screenings. This brief may be downloaded HERE or by clicking the link at the left of the page. The full detailed study report can be downloaded HERE or by clicking the link at the left of the page.